This entry was posted in Group Projects, Homework, Programming, Runaway Ads, Tools. Bookmark the permalink. This is a great report! Impressed by what you’ve been able to do so far. Some of the results I got when Googling the “Required leaf false alarm” error suggests that not all hope is lost for getting that to work. I saw posts, as you did, suggesting that the ratio of positive to negative samples might need adjusting, or perhaps a lower number of stages? If it looks like you need more computing power, let me know and maybe we can request some space on more powerful machines. You also make good points, though, about what we would lose by this method even if it worked perfectly—lots of ads don’t have the icon. 1. Get the input image width, divide it by roughly the number of columns and make that value the resulting cropped image width. 2. Set the cropped image height to something sensible, a little bit larger than the height of a typical ad. 3. Dice the image, storing the start_x and start_y coordinates and correlating them in an index file with unique pic_num. 4. OCR the resulting chunks, and then maybe feed those into MALLET the way Nelson did for the Dispatch to see if a candidate “runaway ad” model emerges that could then lead you back to the exemplary chunks to find candidate ads. MALLET could have trouble with the fact that the chunks will often bridge articles. Could experiment with different height values, decreasing it as needed. It’s not perfect, but nothing is … At least if the cascade classifier method didn’t work, you’d then have another computer-vision method to compare with any text-chunking method you devised. Perhaps I can run createsamples with just image intensity adjustments. That way we could increase the positive sample size by a couple hundred. That said, I really just need to go back and study the documentation to make sure I have all the parameters right. Once we’re ready to give it another try, more computing power would be great. First though, (tomorrow) let’s weigh the pros and cons of icon detection so we don’t waste time or resources. I agree about rough page chunking. It’s worth looking into how conserved the newspaper layout was over time in terms of number and width of the columns. Even if we had to manually set up column widths for each newspaper (e.g. Telegraph and Texas Register), if a certain page number’s layout was fairly consistent over time, that should be plenty good. Or (just throwing an idea out there) if there were a few templates for each page, we might use the rough results of Hough Line Transform to identify which template a page uses. However, I can’t imagine dice_images would produce reasonable horizontal divisions because of how varied article lengths are. If it did, I think your algorithm would work well. But again, I really just think we need to step back and identify our goals. (They’re not so clear in my head, but maybe that’s just me..) Is it pure runaway ad detection? Because if so, just looking for keywords would be simpler. We could generate a word frequency table using known runaway ads. Use the number of matches, as well as a baseline frequency each match word occurs in runaway ads vs other sections of the newspaper to generate a confidence that each newspaper page contains a runaway ad. Then, set a threshold for that score (confidence) to warrant further (human) inspection. Franco and I are taking the course Web Application Development–if we went with this system and got a lot of hits, perhaps we could even make a website to outsource the process of determining which are legit. Similar to how the New York Public Library enlists the Internet to transcribe historical restaurant menus. It would probably be more than a 2-month project though. The Portal to Texas History has a lot of OCR data to work with, but if that collection has already largely been analyzed (or are we trailblazers? ), we might set our sights just on creating a good OCR framework to machine transcribe newspaper page images (again, I don’t know if this is even an untapped realm or if such a collection even exists to work with). I noticed that the ocr txt files for UNT’s newspaper collection have a problem that doesn’t make much of a difference for keyword search but is problematic for chunking articles. It is that the OCR text from one column is sometimes intertwined with text from another column. Perhaps by first breaking the page up into columns, we could run OCR on each cropped image then concatenate the results for a more accurate transcription. We might use a system similar to Ted Underwoods’ for post-processing the text. I also found a method that uses Google’s “Did you mean?” results to spell-correct. We might accidentally over-correct old spellings of words, though. I am hesitant to use MALLET, though maybe that’s just because I don’t entirely understand it. MALLET might do the trick in generating the confidence levels, but we’re not interested in all the potential topics, just that one. 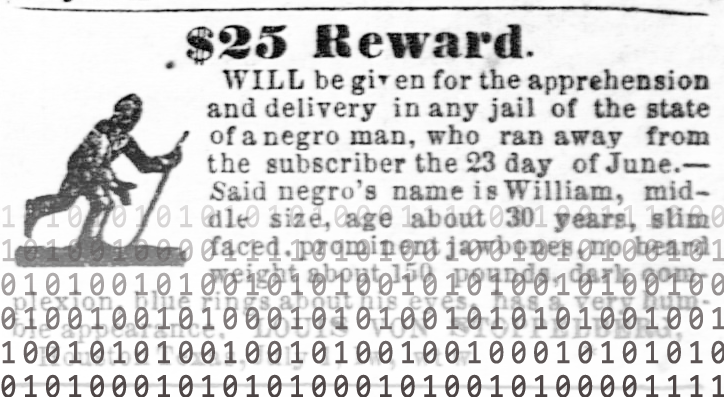 Not to mention how would we even ensure it has a specific, inclusive topic for “runaway slave ad?” I think my idea is doing the same thing, but with a fixed “topic” for runaway slave ad with pre-defined keywords. If our goal is to produce decomposed article images/text for further use by us and others, that might be too lofty a vision. If nothing else, our work this semester will be a learning experience! 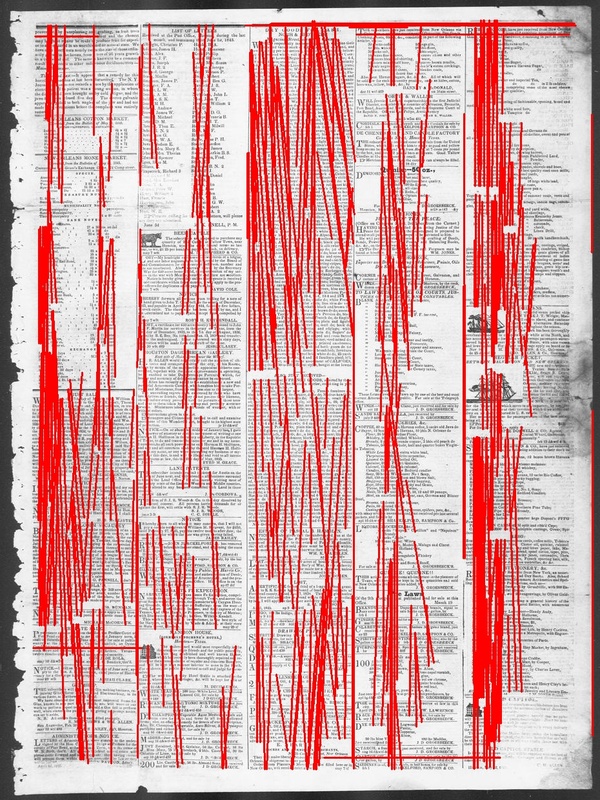 With a research team at the University of Nebraska-Lincoln, I’m working on the detection of poetic content in newspapers from the Chronicling America corpus based on image analysis rather than textual analysis. We haven’t worried about image segmentation yet, as we’re still working on training the classifier to deal with poetic content and non-poetic content, but in the eventual implementation, we will use image segmentation. I’ll be eager to see how your research develops and once we get a little further in our work would be happy to talk about our strategies. I’m really excited about your project, and I hope you’ll continue to work on developing your content-based image retrieval, rather than (or in addition to) focusing on the OCR text. The digital images we are creating for/in these large-scale collections have far more information value than we are currently leveraging, when we use them only as visual facsimiles for human readers. If we focus exclusively on the electronic text, we are ignoring another major source of information that potentially allows us to ask and answer different questions. In addition, advancing image segmentation for historic newspapers and utilizing image processing for content-based analysis has the potential to make resources such as Chronicling America and the Texas Newspapers Project even more usable, beyond a single research interest. On another note, a student here is using MALLET to pursue perhaps a similar type of research question, though again with poetic content rather than the runaway slave ads. In Rob Nelson’s analysis the poetry of the Richmond Daily Dispatch grouped with patriotism, if I remember correctly. The student working here–and I’ll encourage her to comment on her own–is analyzing the poetic content of a newspaper form the duration of the Civil War as well as the content of the newspaper as a whole, in part to see whether there is a marker of poetic content and to pursue some other research questions. 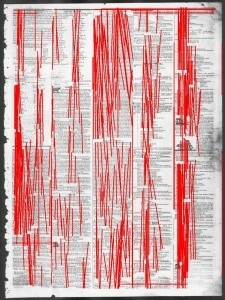 Ultimately,we’re interested in how a combination of strategies can help us learn more about 19th-c. newspaper poetry.